Mahalaya heralds the beginning of the Durga Puja celebrations. 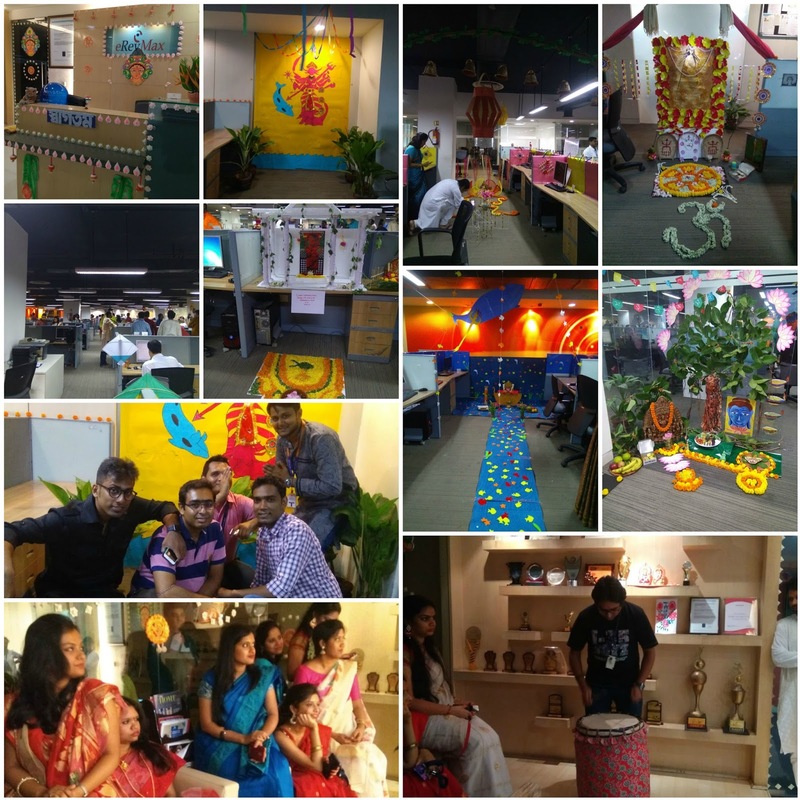 We celebrated Mahalaya in Kolkata office on 19th September with a lot of pomp and splendor. Ladies draped in sarees dazzled the floor, while men looked dapper in traditional kurta and pyjamas. 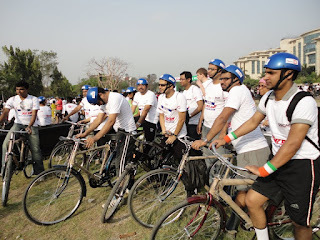 There were a lot of competitions organized to make it a fun filled day. There was departmental decoration which led to all the teams decorating their respective bay areas as per the theme. The teams were at their creative best coming up with unique themes making the bays light up with various colors. The judging criterion was based on eco-friendliness, minimum work space occupied and minimum investment of productive office time. The judges had a tough time choosing the winners. 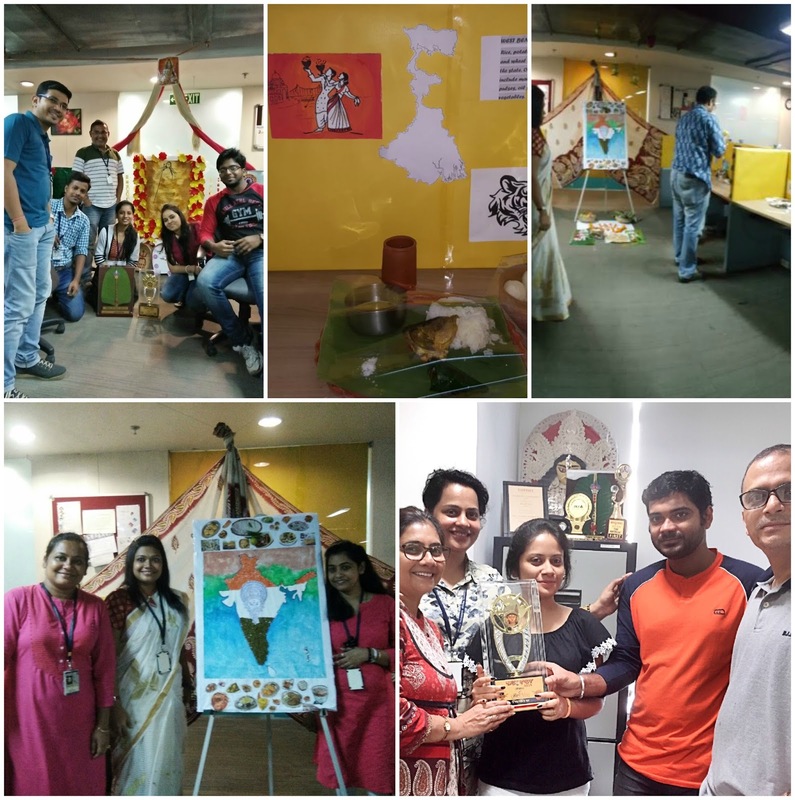 Giving a tough competition to everyone, the RTS Verification & Monitoring team emerged as winners and their bay décor theme being “The Journey of eRevMax to ‘The Gold standard of Connectivity’ with Maa Durga’s Blessing”. The 2ndprize was awarded to the HR & Adminteam with the theme “World Peace”, while the 3rd prize was jointly given to Tech Support & Customer Support for their unique themes – “Preservation of Heritage Kolkata” and “Flavours of India” respectively. There were a lot of other activities including Conch-shell blowing competition, Dhunuchi-nritya, mostly traditionally dressed members etc. Overall, a joyous day spent with lot of fun and laughter – thanks to eRevMax! May this Durga Puja be as bright as ever. May Maa Durga bring all the joy and happiness today and always. Happy Pujas!